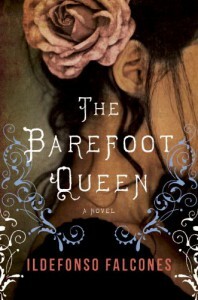 I'd been looking forward to read The Barefoot Queen as I'd been told what a great writer Ildefonso Falcones is many times before. Somehow, I still haven't his first book I remember translated, but I really had high hopes for this one. Caridad, a Cuban slave freed on the death bed of her master, arrives now in Spain without a goal, without any means or money and without any knowledge of life outside tobacco plantations. She's eventually taken in by Melchor Vega, a gypsy, and befriends his granddaughter Milagros. But life will be anything but easy for the two of them. Let me get this straight immediately: I really liked the writing, it was very beautiful. It made me want to read his earlier works just to be able to enjoy it a bit longer. But - there's always a catch - I didn't like the story. You know these stories where everything seems to go wrong and in the end you can't help but feel depressed yourself? This is one of those. They are discriminated - a lot-, imprisoned for being gypsies, sexually intimidated, sold, raped, raped again, and then some more. It made for a very unpleasant read. They were just so passive, let everything happen to them. Even Milagros, who's described as the 'rebellious' gypsy isn't really rebellious. As soon as I realised there wasn't going to be anything happy or simply a bit less depressing in the book, I actually just wished for it to be over.